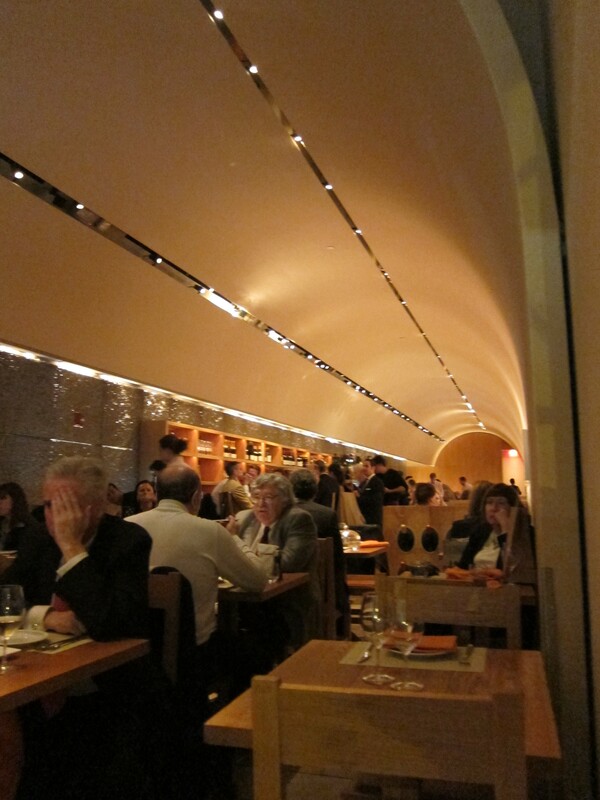 Jen and I discovered Bar Boulud when we used to live near Columbus Circle. It became our brunch alternative to Bouchon at the Time Warner Center. 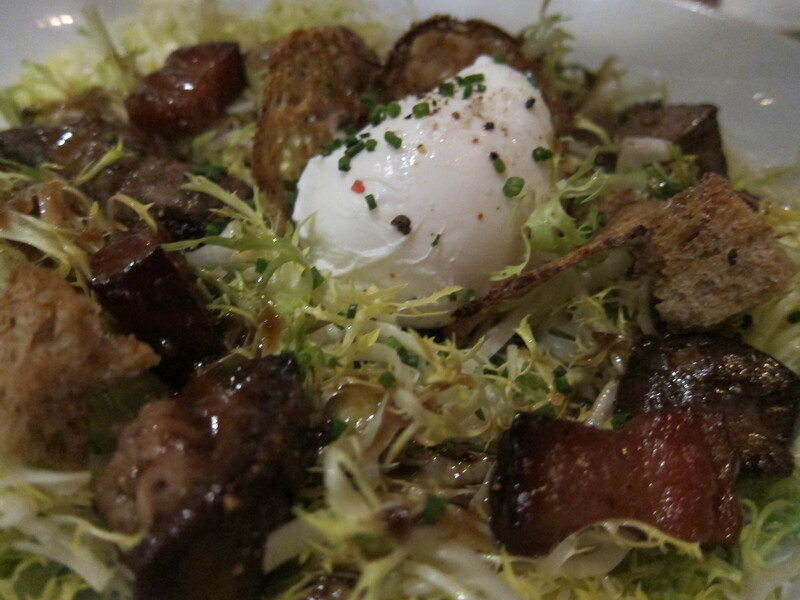 The wine bar/bistro became our favorite spot for eclectic terrines and French brunch fare. The space itself is beautiful too. It is spacious and tastefully decorated with framed prints of wine stains. There is a huge wine cellar downstairs, and you can see the walls of bottles en route to the toilettes. On a nice day, you can enjoy your meal on the outdoor patio and people watch. I have never tried other Daniel Boulud restaurants, but have all of them on the wishlist, especially the three-Michelin starred Daniel and DB Bistro Moderne, home to one of NYC’s most decadent burgers (available only during black truffle season, it is ground sirloin patty stuffed with short ribs and sells for a meaty (pun intended) $150). Our latest visit to Bar Bouloud was before going to see an opera at the Metropolitan Opera House. The restaurant is conveniently located across the street, and we had never had the dinner menu, so Jen and I decided to try it. We ordered oysters and appetizers to share, because they appealed more than the regular entrées. 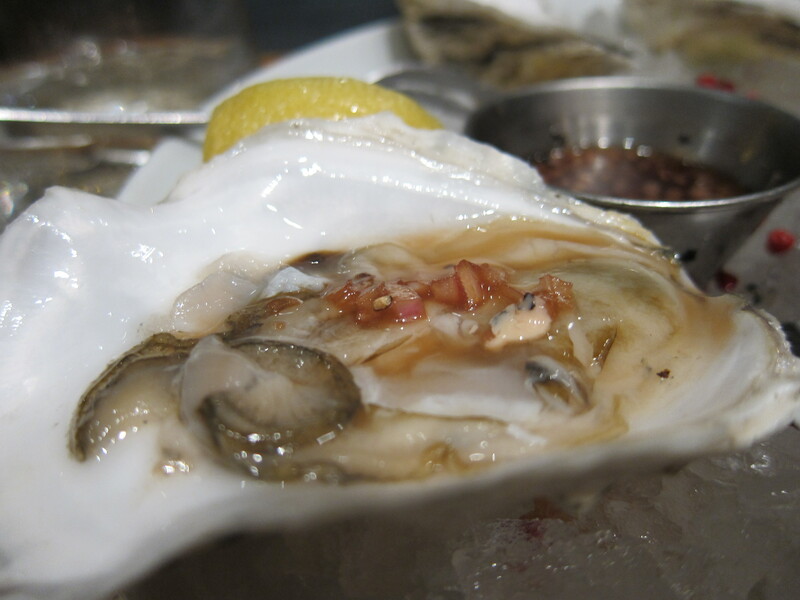 They were served with a typical mignonette and also a creamier, tangier dressing. I prefer the tartness and refreshing flavor of mignonette, while Jen liked the creamier sauce more. But we both loved the Oysters! 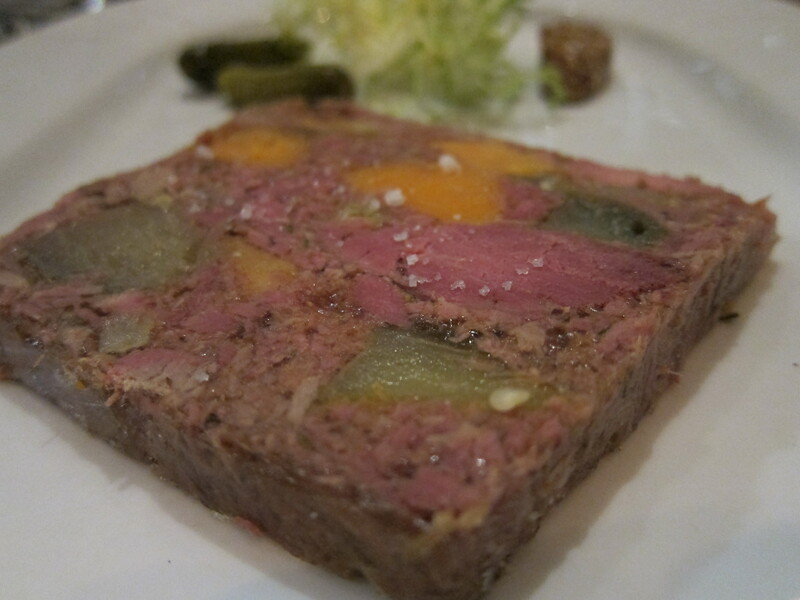 Bar Bouloud is famous for Gilles Verot’s charcuterie for a reason. 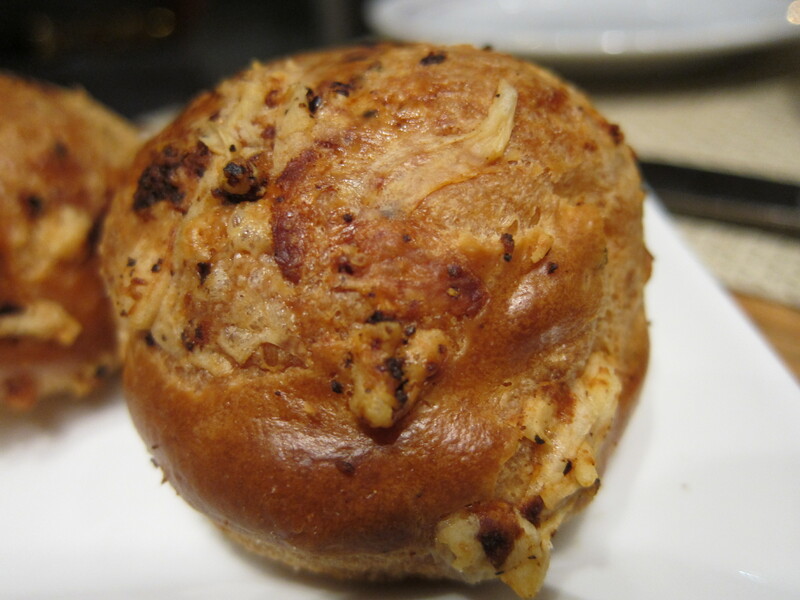 It is a creative mix of delicious ingredients, served immaculately with Dijon mustard and cornichons. Jen and I have tried most of the choices on the menu and all are fantastic if you are a carnivore (rabbit pâté is amazing, chicken pâté is okay). Poached eggs are my obsession du jour (as evidenced by my cooking them and talking incessantly about my favorite preparation of them at Le Bernardin), so I had to get this. The texture and savoriness of the egg combines perfectly with the fattier, grittier chicken liver and bitter frisée greens. The sourdough croutons added another hearty flavor to the mix. This was a really great alternative to a plain salad. 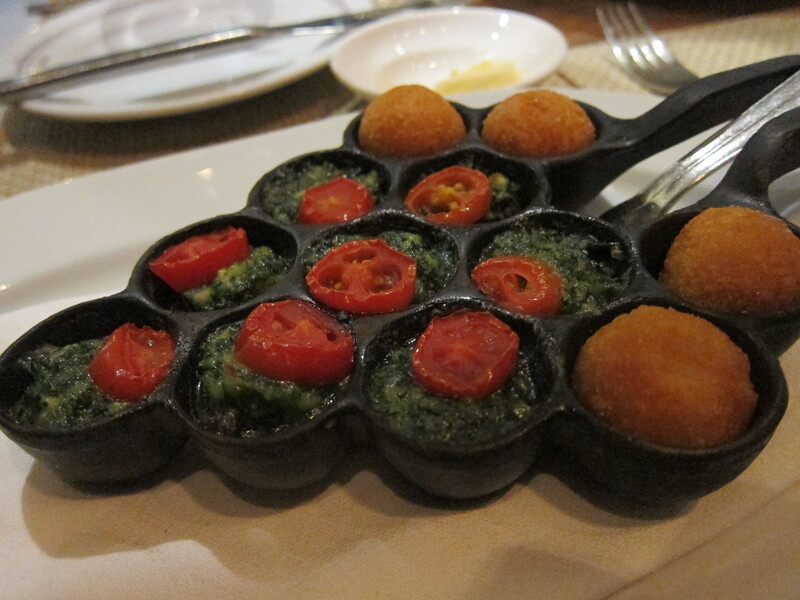 Loved escargot with parsley and garlic (the mixture of which makes the persillade that the dish is named after). 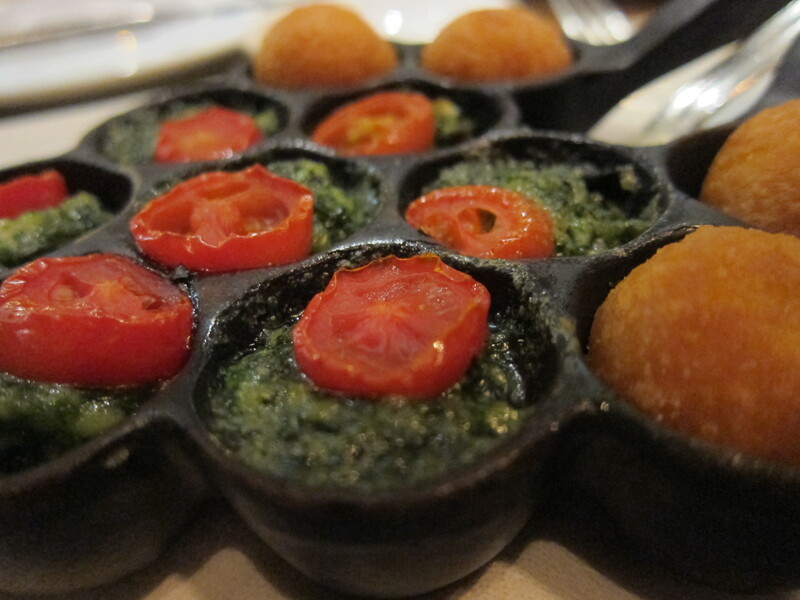 Admittedly though, we prefer snails smothered in butter and garlic instead. Potato croquettes were very tasty as well, but not sure why they were added to the dish. Escargot can usually stand its own. I love raw beef. That is all. 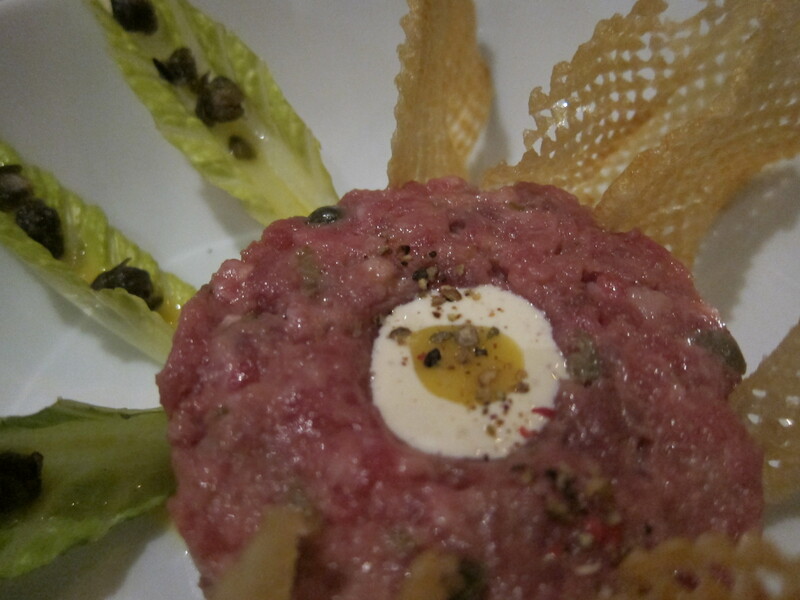 This sweet angus tartar melted in my mouth and left my taste buds zinging with happiness, only to be made even happier by the crispy salty gaufrette chips.